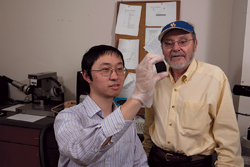 Juejun Hu (left) and Robert Birkmire are working on a project to create a coating on solar cells that will increase efficiency. RESEARCH | The University has won $9.1 million for solar energy research and development through the SunShot Initiative sponsored by the U.S. Department of Energy. UD was awarded five grants and one subcontract, far outpacing all other major research universities competing for funding. Mark Barteau, senior vice provost for research and strategic initiatives, attributes the University’s success in the competition to the outstanding capabilities and leadership of the Institute of Energy Conversion (IEC), which is involved in each of the grants. In a subcontract from the National Renewable Energy Laboratory in Golden, Colo., using several of IEC’s unique capabilities to contribute to the lab’s program to reduce the cost of CIGS technology. In addition to IEC researchers, some of the projects include faculty members from the departments of Materials Science and Engineering and of Electrical and Computer Engineering.